Hoteliers and licensees are being warned about trying to pass off cheap vodka as a brand name. Three premises in Blackpool have been fined a total of £1,400 for decanting "inferior quality" vodka into Smirnoff Red bottles. The practice, known as "tipping", is being targeted by the resort's trading standards officers. The International Federation of Spirit Producers says that "tipping" costs consumers about £40m a year. Trading standards officers carry authenticity kits for brand name spirits which give an instant result. The three premises prosecuted in Blackpool were uncovered during routine hotel inspections. All of the instances involved Smirnoff Red vodka. 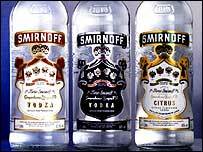 Although the bottles were marked with the brand, none actually contained any vodka made by Smirnoff. Blackpool Council says that anyone found "tipping" faces a maximum fine of £5,000 and up to three months in prison. They also risk losing their licence.